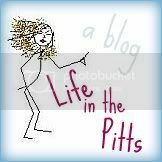 Life in the Pitts: "First grade called"
"They want their attitude back"
When I get bored, I revert back into a 6-yr old. In our single days, me and my roommate Kendra (who also had this problem) would glare at each other during church, steal each others purses, and pull each others hair. We were 22. Kurt and I drove through the rain on our way to Michigan this week. Well, that's what I've been told- I was sleeping most of the time. I don't think we hit any animals, which is a nice change. When I woke up, we talked about one of my favorite topics: other girls Kurt dated. I have this sick obsession with talking about them, and trying to figure out if they would have made a better wife than me. He told me about how a year ago his coworker was trying to set him up on a date. But it didn't work out, because the girl was weird. "Actually, that whole family was weird." He hesitated. HESITATED. Which means... "So you think I'm weird. Thanks Kurt." He got this panicked look on his face, like OH CRAP SHE'S MAD. A few minutes later we pulled into a gas station. "Um, we're almost there. Do you want to go put on your makeup?" WHAT?? "You think I need to go put on makeup?" There was that look again. "No! It's just, you usually want to-"
"Awesome" I cut him off. "First I'm weird. Then I'm ugly." I stalked towards the gas station, thinking "someone's not getting any tonight." When I got there, a huge black man was leaving the building. He looked like he was about 68, was well over 6 feet tall, and very round. "Well hello beautiful!" He drawled, tipping his hat. Then he hopped in his car and drove away. Adorable. When I got back to the car, the first thing I said was "I almost ran away with a giant black grandpa. Because HE appreciates me." I know, I know. I'm awful. But I had to do SOMETHING to keep myself entertained. And since Kurt's hair is so short, I have to think of other ways to torture him. Hahaha! At first I thought you said a giant black panda... then I reread it. Oh man... Poor Kurt. Lol! I agree with Chantel, you don't need makeup. This totally sounds like you, when I read your post I could totally picture everything you wrote very clearly...probably because I have been there (in Kurt's shoes)so many times:)! You crack me up! I love talking about Lance's ex girlfriends and seeing if they would make better wives as well. I still do that, even today after 2 1/2 years. "I bet (name is witheld) would do that for you. I bet SHE looks good first thing in the morning. I bet she would make a better wife than me." He always remains speechless, which is probably the best thing he can do. I'm glad I'm not the only one who has thought that "someones not getting any." haha!